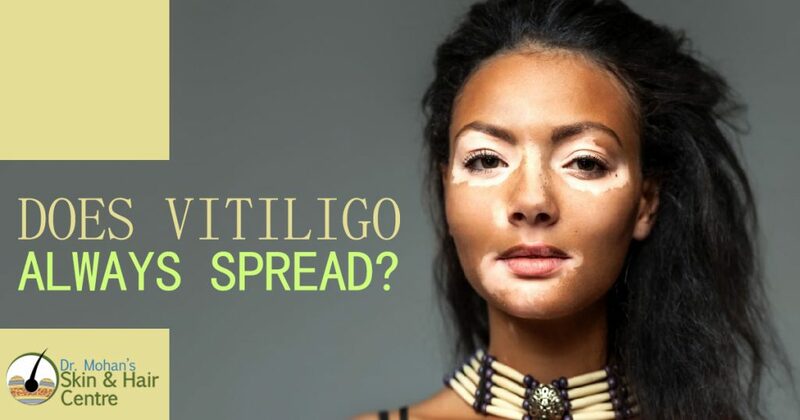 Vitiligo is a problem in which patches start appearing on different parts of the body such as eyes, inside the mouth, and the hair. This problem happens when the cells are completely destroyed that make the color (pigment) and they are known as melanocytes. The problem is photosensitive (the affected area is more sensitive to sunlight as compared to other body parts). However, patches are more prominent if you have dark skin. Some of the Vitiligo causes are pigment-producing cell die, a disorder that affects the body’s own immune system. In addition to this sunburn, stress, exposure to industrial chemical, deficiency of Vitamin B12, folate, zinc, and copper. Chances are very rare that this can pass to the children’s which means this condition is hereditary. Some major complications are inflammation around the eye, skin cancer, hearing loss. It is better that you should consult the doctor at the right time when you first notice the problem so that it can be cured. Do Patches Spread Over Time? One of the most common questions which patients ask is whether the patches will spread or not. For this, there is no exact answer. People who develop this condition notice pale or white patches on the skin. In some cases, the problem of white patches remains stable (do not spread) for several months or years. However, sometimes the patches spread at a very fast speed to other parts of the body also. Initially, the patches are very small, but after sometime they grow and also change their shape. Due to this, it affects the person both emotionally and physically. Some patients also think that this problem is contagious, which is also not true. It means it won’t spread by touching the other person as this condition is an autoimmune disease (body’s own immune system attack the healthy cells) and exposure to environmental factors. There are some options for Vitiligo treatment which your doctor might recommend you as there is no cure for this condition. At the early stage, if the discoloration is controlled then it is good, but it can trigger again if some of the factors persist. The choice of treatment depends on different factors such as the number of patches, how much they are spread, and the patient preference. Keep in mind that all the treatment options might not suit everyone as some of them might give unwanted side effects. The treatment takes longer to treat the problem effectively. Some options are medical (oral medicines), surgical (skin grafts) and other treatments (sunscreens). The main aim of the treatment is to restore the skin color. You should consult the doctor which method will suit you and then only move forward with the treatment.